If at first you don't succeed...Hire a professional! Vans Hauling (www.VansHauling.com) missed a lot of business opportunities due to the fact that they couldn't get found on Google with their previous site. BANG! delivered and they are now at the top of Google's search on page #1 and their contact requests continually pour in. We truly wonder how many business owners take a crack at building their own website and end up with zero results to show for it. Though many that build their own site and don't see results may just take the attitude that the Web simply isn't the tool for them to market their products or services we are thankful when companies like Van's Hauling give us an opportunity to prove that thinking wrong. Our solution: Van's Hauling offers some unique services to a large geographic target market and to us that meant lots of potential for results. Through careful research, we determined exactly what their prospective customers were searching for then built a site to be found for those keyword phrases. Results: Many first page Google rankings drove traffic to the site. Once there, site visitors converted into prospects by filling out the contact form. One month they had 19 potential customers contact them through the website! "The team at BANG! Web Site Design is wonderful - from the initial concept of the website to the training provided to manage the site myself. The entire process was completed in a professional manner within a month. 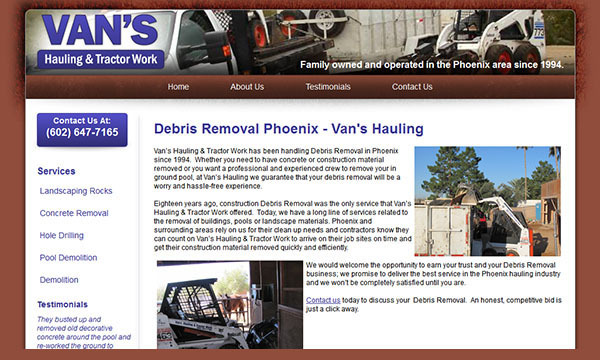 Our site has been live for a few months now, and we can already find Van's Hauling on page 1 of Google! We have also received several contacts from potential customers from the Contact Us page. We made the right decision to hire BANG! Web Site Design to build our site. We highly recommend them to anyone seeking a presence on the internet." Are you ready for results from your contractor website? Contact us today to put our crew to work for you!